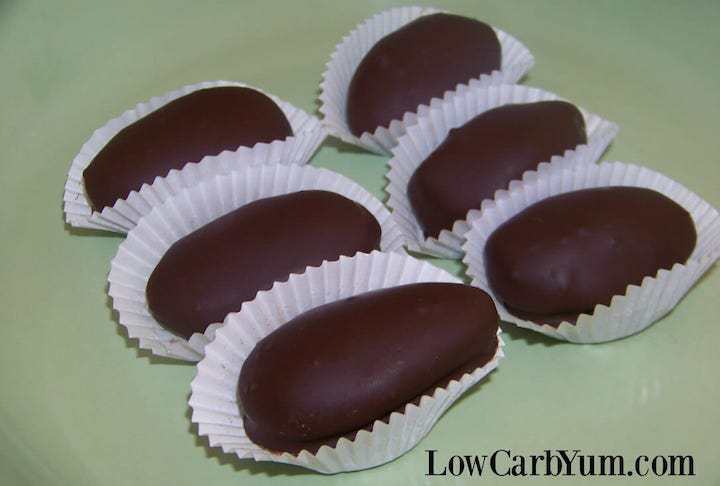 A low carb and sugar free chocolate covered buttercream candy recipe that’s easy to make. Simply make the filling, chill, then dip into chocolate. After making the Almond Joy candy bars, I thought I should make another batch without almonds. And, I wanted make them in egg shapes for Easter. Although that was a good idea, I ended up trying a new recipe for homemade Easter candy. 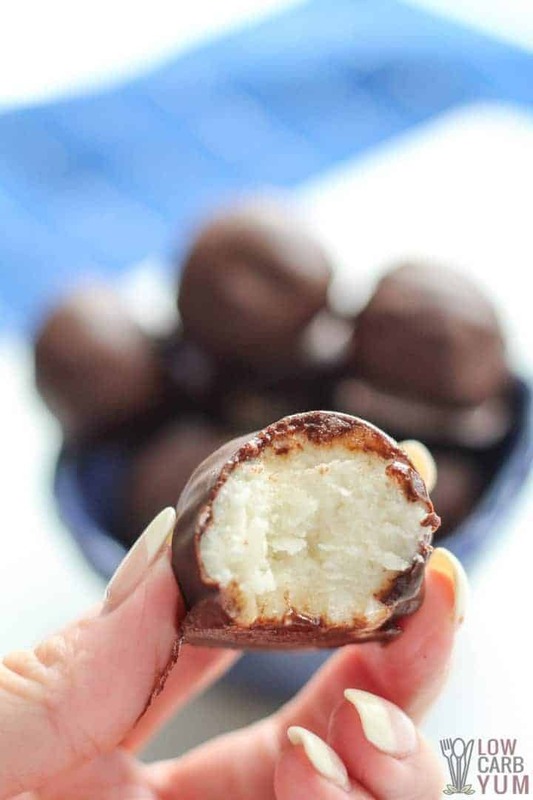 I modified the Land O’Lakes buttercreams recipe slightly by using a low carb substitute for powdered sugar and using a low carb chocolate coating. This chocolate covered candy uses the same chocolate as the Almond Joy bars. The results? OMG! This buttercream candy is just like the ones you find in those boxes of chocolates. I can’t wait to try other flavors. 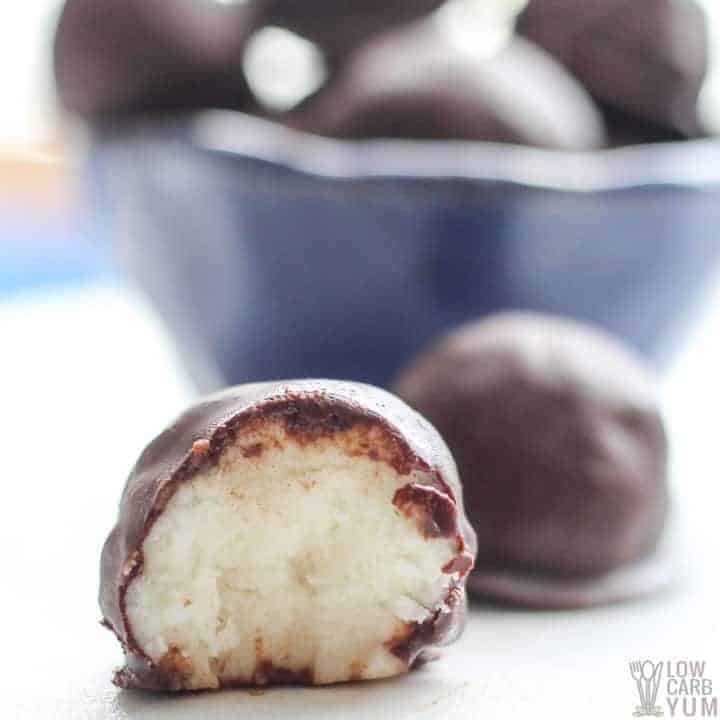 The great thing is that these buttercream truffles can be made in any shape you want. Typically, I just make balls dipped into chocolate, but they can be formed into any shape. You can even set the buttercream filling into chocolate in a candy mold. To celebrate Easter, I make buttercream eggs rather than balls. However, a mock chocolate covered candy like the Cadbury egg could be made with this filling by using a yellow food dye to color a bit of the filling. For a fun egg colored filling, all you would have to do is made small yellow “yolks” and then cover them up with the regular white colored filling. Dip the eggs into the chocolate, let set, and voila… a low carb version of the Cadbury cream egg for the perfect sugar free Easter candy! 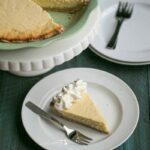 The filling is just a blend of softened butter, softened cream cheese, flavored extract, and powdered confectioner sweetener. I like to use vanilla extract, but you can change it up by using maple, orange, or other flavored extracts. Once blended, the mixture is chilled for about an hour so it’s easier to work with. Next, the buttercream filling is scooped out and molded into the desired shapes. Once shaped, it’s frozen while melting the chocolate coating. Freezing ensures that it won’t melt easily when dipped into the warm chocolate. For the chocolate coating, I melt together baking chocolate, cocoa butter, powdered confectioner sweetener, stevia extract powder, and vanilla extract. The frozen buttercream filling is then dipped into the melted chocolate coating. I find it best to cool the chocolate down slightly before dipping. And, for a thicker coating, I like to dip the candies again for a second coating. The buttercream centers can also be placed on top of a layer of chocolate in a candy mold and then topped with more chocolate. This is the process I use to make my keto peanut butter cups. Once made, the candies are put into the refrigerator to set. And I store them in the refrigerator inside a covered container. These low carb candies are super easy to make and perfect for celebrating Easter without sugar. You can make it even easier by just melting down low carb chocolate chips or bars to dip the buttercream filling in. Other low carb candies that I’ve made for the holiday include sugar free white chocolate bars, white chocolate truffles, white chocolate coconut bark, chocolate truffles, and chocolate peanut butter candy. There’s so many options when it comes to making your own sugar free candy! What’s your favorite holiday treat? We hope you enjoy this easy to make chocolate covered candy recipe. And if you do make the candies, we’d love to know what you think in the comments below. 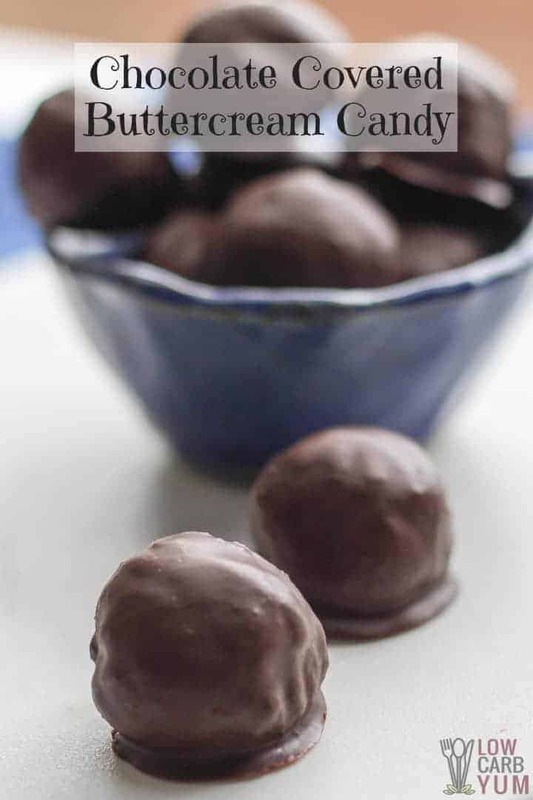 This low carb and sugar free chocolate covered candy recipe is simple to make. Simply make the filling, chill, then dip into chocolate. Combine butter and cream cheese in large bowl. Beat at medium speed, scraping bowl often, until smooth. Add vanilla; continue beating until well mixed. Reduce speed to low. Beat, gradually adding low carb powdered sugar replacement, until well mixed. Place mixture in refrigerator for about an hour (or at least 10 minutes in freezer) so mix is easier to work with. Use spoon or cookie scoop to scoop out even sized balls. 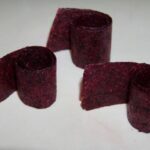 These can be shaped into squares, made into egg shapes (for Easter), or any other shape desired. 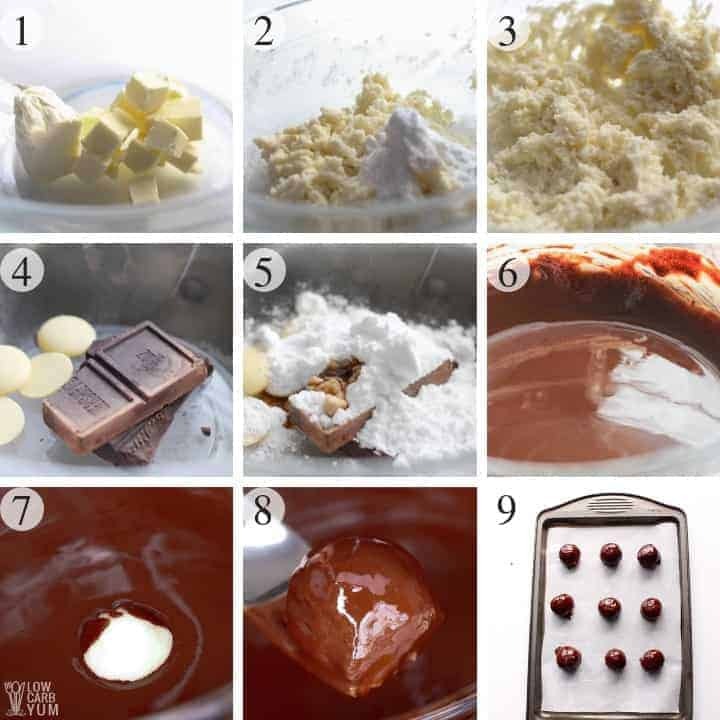 Place shaped filling in freezer while making chocolate coating. In a chocolate melter or double boiler, melt all chocolate coating ingredients together. Remove the shaped filling from the freezer. Place each on a fork and into melted chocolate until well coated. Wipe excess chocolate off bottom of fork on side of melter and then set on non-stick sheet to harden. Repeat until each is covered in chocolate. The buttercream filling can be dipped into the chocolate coating multiple times for a thicker chocolate layer. Be sure to let each layer set before dipping again. Alternatively, the shaped filling can be set in the middle of chocolate using a candy mold. 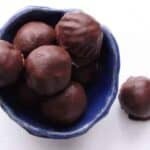 [post_content] => This low carb and sugar free chocolate covered candy recipe is simple to make. Simply make the filling, chill, then dip into chocolate.